Below is an adaptation of the live webinar delivered by Mathew Greenwald and Cindy Levering of the Society of Actuaries in 2016. Their comments have been edited for clarity and length. 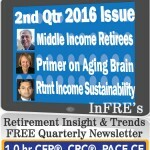 You can read the summary article below as part of the 2nd Qtr 2016 Retirement InSight and Trends Newsletter. You may also choose to take the full length course here, worth 1 CRC®, CFP® and/or PACE CE. Why has the Society of Actuaries created this body of research over the last 20 years? The complexity of retirement security is increasing. A lot of defined benefit plans have gone away. Even in the public sector, where benefits are being pulled back, more responsibility is being put onto American workers for their retirement security. The lack of financial literacy and lack of planning for the future are big problems. There is less retiree health coverage so we’ll have to fund more of these costs on our own. Retirement periods are longer. The definition of retirement is changing. People have to work longer than they expected. Many baby boomers are not well prepared, as we all know. As the population ages, the needs of the very old become very important to society and economic stability. Those of us in the sandwich generation are those trying to also save for retirement. Money that would otherwise go into our own retirement savings might be spent on helping our family members who are older, because they didn’t have enough savings. There’s also great uncertainty about the future changes in tax policy, Social Security and Medicare. The Society of Actuaries’ Post Retirement Needs and Risks Committee (PRNR) was spearheaded by Anna Rappaport, FSA, ASA back in the late 1990s. The interesting thing about this group is that it is a multidisciplinary group of individuals from many different walks of professional life who have since then worked together every year on retirement-risk related research. The overall goal and the research of the PRNR over the last 20 years is to help us better understand and improve post-retirement risk management, really focusing on those people ages 50 and older. Retirees’ Biggest Financial Concerns about Retirement. Greenwald and Associates has been working with the SOA biannually since 2001 to survey Americans ages 45 to 80 on a variety of issues pertaining to the risks in retirement and concerns in retirement. In 2015 we did an online survey of 2,233 people that are pre-retired or have retired. To supplement this work in 2015, we did twelve focus groups with people who have been retired for 15 years. As background, early on we realized that there was a lack of planning for retirement. The SOA wondered, what were the implications for that? About three years ago we interviewed people who had been retired for five to ten years, and then did a second study to see what happens when people have been retired for at least 15 years. 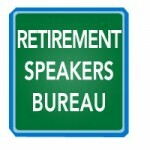 How did they deal with the shocks that are inevitable to some people at least in retirement? We went to Chicago, Baltimore, Dallas, and also two locations in Canada, and did focus groups with people who had assets between $50,000 and $350,000. We focused on people who had defined benefit income of no more than $2,000 a month. We also realized that we couldn’t invite people who needed long-term care to attend focus groups because many of them were impaired or frail and couldn’t get there. So we talked to people who were caring for them, for a total of 15 interviews, 10 in the U.S., five in Canada, who were all familiar with family members who needed long-term care. Our goals was to learn more about the most common financial shocks they experienced during the course of their retirement, and how they dealt with them. So this is the language people who have been retired for at least 15 years use in talking about the shocks of retirement. Sometimes people who have been retired for a long time live in houses that they raised their kids in. These are old houses they’ve been in for a long time. When we asked another person about how much her mother had left already after her father needed long-term care and then died, the amount she had left over was “none”. That’s why she’s doing a reverse mortgage and she was fortunate to have a house to fall back on. We asked retirees in our sample of over a thousand, “Have you or your spouse/partner experienced any of the following most commons shocks retirement?” Almost 28% had a major home repair. A quarter had major dental expenses. One in five had significant out-of-pocket medical prescription costs. Fifteen percent had an illness or disability. Some ran out of assets. More on that later. Fourteen percent has a sudden loss of the value of savings. Things happen over the course of retirement. Of the people who experienced the shock by how much, if at all, did these shocks reduce their level of assets? For a quarter really nothing perceptible happened. Thirty-six percent had a reduction of less than 25 percent, another 25 percent were reduced 25 to 74 percent, and 14 percent had assets reduced by at least 75 percent. So that’s a little over one in five who’s had these shocks reduce their assets by at least a half. How much did these events among the people who experienced the shock reduce the amount of money they were able to spend each month? Again, for about three in five it was less than 10 percent. But for 25 percent they had to reduce their spending by at least a quarter. So we see that shocks have an impact. When we asked, “How well have you been able to manage with these new financial constraints?”, 17 percent managed very well and 26 percent managed not too well or not at all well. So this, in some ways, is a metric, a measurement of the impact of shocks over the course of retirement for people age 80 and below who are not all fully through the retirement period with more shocks yet to come. Then we asked, “To what extent do you agree that there was something you could’ve done ahead of time to lessen the financial impact of these shocks?” My view is that there are a considerable number of things that people could do to lessen the impact of shocks, although many of them should not be surprising and many of them have the certain risks and can be dealt with in different ways. But 60 percent disagreed that there was anything they could’ve done ahead of time to lessen the impact of these events, something they feel cannot be planned for. When we also take into account the information the focus groups, there’s a variety of shocks that people face. The most devastating ones are long-term care and divorce. If you’re going to get divorced, do it before you retire. If you do it after you retire, you lose half your assets and can sometimes lose the home; there’s no way to recover. Also having a child with severe needs. It’s not uncommon for a child to need a loan of $5,000 or $10,000 but a child who cannot take care of themselves at $30,000 – $40,000 a year, is very difficult from a financial and from other points of view. Most retirees absorb and adapt to unexpected expenses and do a reasonably good job. If it’s not one of the devastating ones people basically do fine. Some try to reduce spending to restore the asset cuts, some as we saw a significant proportion just spend less. Putting this in perspective, this pales to the loss of health or the significant problem with children have. That affects retirees much more than the financial aspects and we shouldn’t lose sight of these. But the shocks for a significant portion of the population has significant expense. I said before, many unexpected expenses can be planned for but people often don’t plan for them. In terms of caregiving, very few have long-term care insurance, which is one thing that could be planned for. There’s an effort to care for people at home until the burden becomes too high. The care can run hundreds of thousands of dollars, and spousal impoverishment is a risk. It’s one thing to run out of money and be the last person in the household. If you run out of money and you have a spouse that’s alive with many years to go, it’s a different situation. In terms of the way people approach the issue, it’s not a structured thing, but you have an idea. I think that’s a good description of how people deal with planning for risks. They adapt and adjust. They wait and when something happens they deal with it. It’s not a structured thing, but you have an idea. You know what you’ve got to spend and you put your money in those places and you work towards that goal. If you don’t use it then you build something else that you can use. 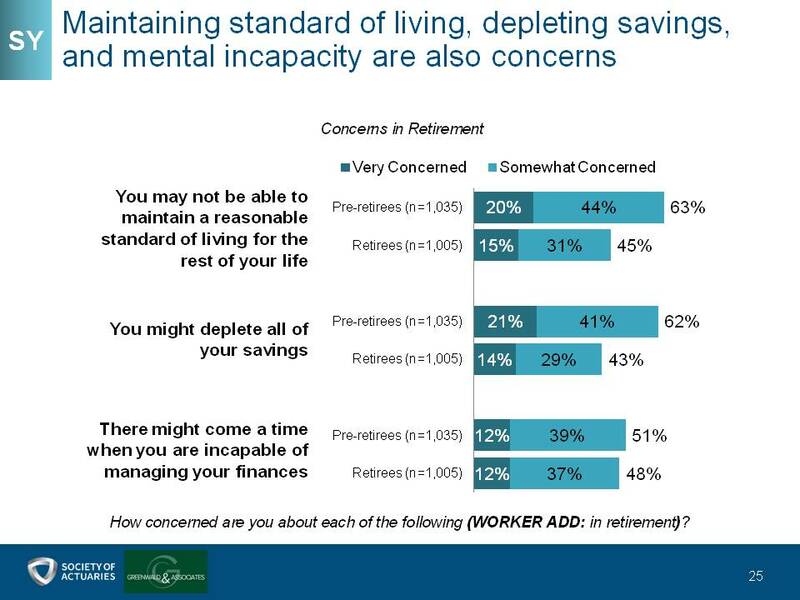 As we measure concerns, we see the pre-retirees are, in every case, more concerned than retirees. When people retire they’re there and they deal with the situation. Major concerns are things that people can’t control meaning long-term care, inflation, not having enough money to pay for adequate health care, which is kind of interesting because between Medicare and a good supplemental policy, people have a lot of insurance coverage there. That’s one thing where there is protection against risks to a significant but not complete expense. A lower level of concern is not being able to maintain a reasonable standard of living. Still high but lower, is depleting savings. That is something that people can control but there’s still significant a level of concern. There also might be a time when you’re incapable of managing your finances. In almost every case, pre-retirees are more concerned than retirees where it gets down to basically other aspects of retirement, but concerns about finances are when retirees’ concern gets up to almost the level of pre-retirees. There is significant amounts of concern with inflation but people, once they’re retired in at least the earlier years, seem to deal with it reasonably well. They do substitution, they buy chicken not steak. But over the long course of time it does have a corrosive effect. In low inflation times, in a decade your money will lose about 28 percent of its value. That’s one thing. That’s in the first decade of retirement. The second decade of retirement, their assets lose another 28 percent of its value. Now your assets, if you’ve been able to keep them at the same level, are worth half of what you started with. We see reasonably high concern about inflation with pre-retirees more concerned than retirees, thinking it will affect the amount of money they need each year in retirement. When people get there, they adjust. 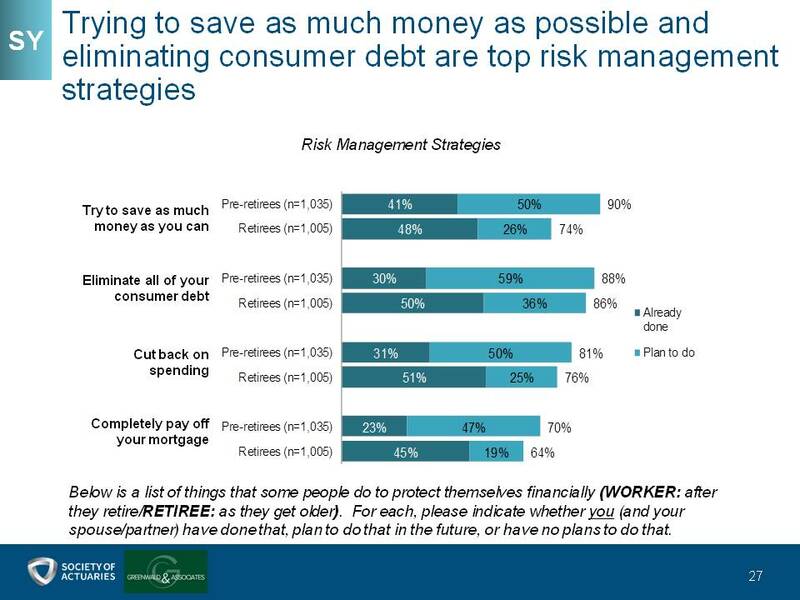 The basic way that people deal with risk is they do what they feel they can control the best, which is how much they save and how much debt they have, and do not use other instruments. It’s interesting in working with advisors in many cases, because people don’t talk to their advisor about their spending level. That makes it hard to estimate how much they’re going to need in retirement, for example. That’s sort of a more personal thing. So below is a list of things that some people do to protect themselves financially for workers after they retire and for retirees as they get older. We see that the main thing they do or plan to do is cut spending, eliminate debt, cut back on spending or save as much as they can and pay off the mortgage. We also see, in every case, that more pre-retirees plan to do it than wind up doing it. Some sense of moving to a smaller or less expensive area: A lot of pre-retirees plan to postpone taking Social Security but we see that doesn’t happen when push comes to shove. The majority plan to postpone retirement, but again that doesn’t happen. We also see that buying an employer plan option that will provide guaranteed lifetime income is at a significantly lower level, although there’s still 20 percent of pre-retirees who plan to do that. When we asked retired widows, did you and your spouse consider and plan for how you would respond if you lost your spouse; the majority did not make any plans for that. And one-third did not even consider doing anything to deal with the loss of a spouse. Again, a lack of planning. 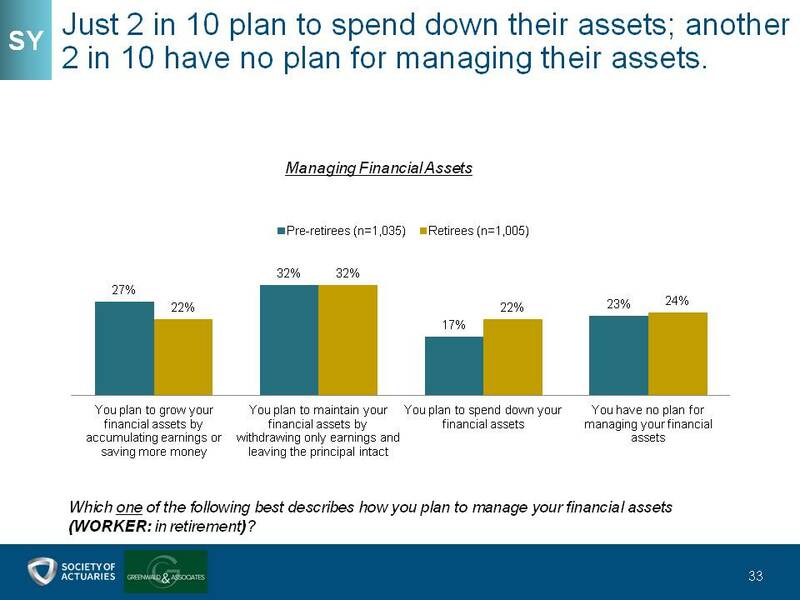 So when we asked people, “Which one of the following best describes how you plan to manage your financial assets?”, if you look at the third set of bars, you plan to spend down your financial assets, we see that describes roughly one in six pre-retirees and one in five retirees. And I think that’s important because as we look at, well, the economic theories about lifecycle spending, the theory says that people raise their assets and spend them down, raise their assets while they’re working and spend them down in retirement. When we look at the 4 percent rule, the idea is how much can I spend so I have at least one dollar after 33 years? Using Monte Carlo modeling, success is having one dollar at the end. Systematic spend down is one of the theories, but that’s not the way people want to live their financial lives in retirement. We see that 27 percent of pre-retirees and 22 percent of retirees plan to grow their financial assets by accumulating earnings or saving more in retirement. Another basically one-third plan to maintain their financial assets by withdrawing only earnings and leaving the principle intact. About one in four don’t have a plan. Now, how that will change as retirements last longer and there is less defined benefit income coming in for the next generation of retirees, it will be very interesting. But I think the main point here is this goal for the majority, is to either maintain or increase asset level through retirement. I should also add by the way on this point, that when people think about this they don’t think about the real value of their assets. They think about the nominal value of their assets. So keeping assets the same over 20 years, as I’ve indicated, means the real value of the assets just by inflation in a low inflation period will be cut in half. So to some extent they’re cutting the value of their assets just by keeping it at the same level. But that’s what they want to do and then adjust their spending to make up the difference. Do you currently have a plan for how much money you will spend each year in retirement and where that money will come from? 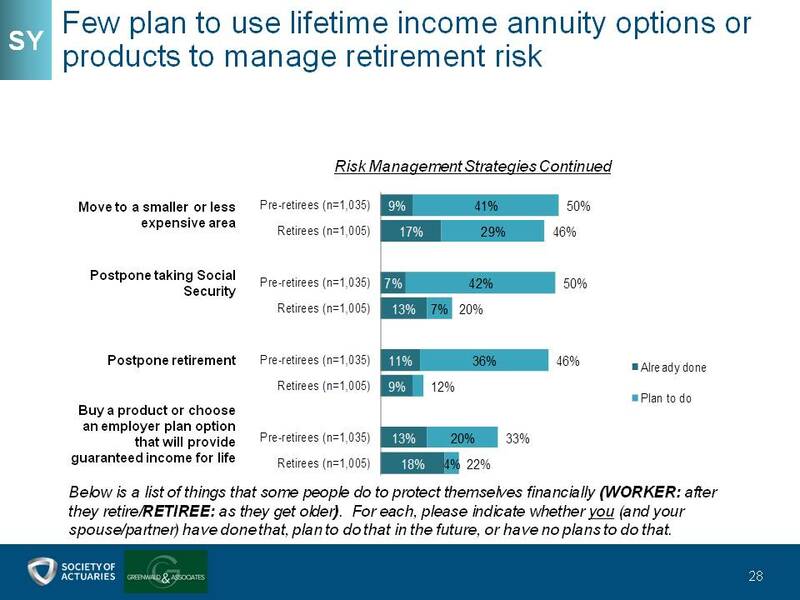 Basically pre-retirees don’t have a plan by the majority and retirees too, which makes sense. Forty percent say they don’t have a plan. But what I sense in doing the focus groups and other retirement surveys, is they sort of have a feeling for this. They wouldn’t describe it as a plan but they very much have in mind the goal of keeping their asset level at at least the same level or trying to make it on Social Security and pension, or just skimming off earnings when there are any on their investments. So it’s not that it comes from the level of a plan but it comes from the level of something they pay attention to. We see some things working well and other things not working well. In terms of working well, by and large adapting to retirement financial shocks, not everyone, because some people have devastating losses. We see maybe a quarter of people that really are hurt badly, but for the other three-quarters, it seems like they can adapt. People often adjust spending to preserve assets. They go from wants to needs. But right now with this generation, that’s not a painful trip from wants to needs. Some of them use parental retirement experience to recognize risks and plan for them. Especially as we get to the people who have been retired for 15 years or in their late seventy’s, they have parent who went through the depression and experienced frugality and communicated some of that. That makes it easier for people to become more frugal as they go along. For retirees planning for routine annual spending needs, it is working reasonably well. People adjust and manage their lives and substitute and deal with inflation and stretch their dollars in a reasonable way. A number of people in retirement are able to reasonably limit the drawdown of assets in retirement, especially people with defined benefit income. But areas of improvement in planning are needed by people who are not retired for their retirement needs and income sources. There’s a lack of having a reasonable target to how much they need to retire, a reasonable target for saying when they can afford to retire, a reasonable planning for where their income will come from, a plan for the impact of death on the surviving spouse or partner. For a lot of people it’s just something that isn’t considered. There’s various tactics that can be used and people don’t use them. We see a lot of people plan to work during retirement to supplement income or plan to work longer, but don’t. Planning to postpone retirement to accumulate greater assets, and also budgeting for unexpected yet predictable shocks are also areas for improvement. We also know pretty well that older people tend to have larger dental bills. It’s a surprise to people but yet it shouldn’t be. Another area of improvement is to use insurance products effectively to mitigate their risks of retirement and to some extent to make retirement less expensive. It seems to me that one of the key calculations that people make as they prepare for retirement is making the calculation of how much they need, and then when they’re retired, making the calculation of how much they should have at different stages. We’re not good at giving people a target really for how much they should have but in retirement I think a lot of the industry and a lot of advisors are silent on now that you’re 70, what should you have at age 75 or age 80. How should you really most effectively manage your spending, your investments to targets later on? While the “absorb and adapt strategy” works reasonably well, better planning tactics for how to anticipate some of these expenses would be beneficial. There are needs to incorporate planning for non-routine expense retirement planning that are likely. So one of the things I think people tend to do to the extent that they estimate their expenses and retirement and then come up with how much they need to be able to meet those expenses is they don’t incorporate non-routine expenses. They just think about their routine expenses, what they paid last month. Companies depreciate items like cars, furnaces and roofs, but individuals don’t. That depreciation will give them a better sense of what are their expenses and how much do they need to save to pay for those expenses. Many need help in thinking through strategies to deal with long-term care risk. Now, I know a lot of people are concerned about the cost of long-term care insurance but there’s a variety of other approaches that can be used including the use of home equity. It would be useful for people to really have a more thoughtful approach of what they want to do if there is a long-term care need, especially dealing with the risk of spousal impoverishment. Another thing that I think is important and a lot of financial advisors don’t really deal with is helping their clients deal with which Medicare supplement policy to use or whether to use Medicare or Medicare Advantage. It’s important and it’s kind of a big financial impact and people struggle with that. I would also like to bring forward two ideas for a financial practice I think would be useful. One is reversionary annuities. Reversionary annuities is a life insurance policy that doesn’t pay a lump sum. It pays guaranteed income for a period of time and often for life. I think this could be helpful and could be applied certainly to pension maximization for people who do have a defined benefit plan and to deal with the loss of income. It’s cheaper than a death benefit. Life insurance pays a lump sum and sometimes it’s much cheaper because you’re really underwriting the insured and the beneficiary and just paying for the difference in life expectancy. But it could provide much more effective protection for the survivor. Also I commented before that a lot of people are concerned about standalone, long-term care insurance. But in some ways standalone long-term care insurance is a mismatch between the risks to a husband and wife family. The financial risk is not just on one person. It’s on the husband or the wife. What difference does it make who needs long-term care? The money comes from the same source. So maybe it would be more efficient and more appealing if one product could cover both the husband and the wife. One concept that might do that is the first-to-die living benefit life insurance policy, that if the first person dies without needing long-term care, there’s a death benefit that could protect the second person. But while both are alive if one of them or both of them need long-term care, the value of that policy up to the death benefit could be used to cover them, whichever one it is. I think one of the things we might do to help people deal with long-term care risk is to innovate in terms of the product design. Finally, the next generation is further from the Great Depression. The next generation is less likely to talk to people who were frugal. It seems to me that the price of going from wants to needs may be more difficult and more painful to them, which makes it more urgent to help people accumulate enough money so they don’t have to. They’re less likely to take that trip and help them deal with other ways of dealing with risks so a financial shock will be something anticipated and planned for and won’t cause them to go with what might be a more difficult journey to frugality. Having said that, I would like to mention that the SOA has reports on this research and other resources of information. 2015 Society of Actuaries Biennial Risk Survey (started in 2001); conducted online for first time in 2013. Kitchener, ON; Edmonton, AB. Half of groups were male; half were female. Participants had assets between $50,000 and $350,0001. No participant had household defined benefit guaranteed lifetime income exceeding $2,000 per month. 1U.S. and Canadian dollar figures are treated as equal. The Society of Actuaries’ Committee on Post Retirement Needs and Risks is pleased to make available a research report summarizing twelve focus groups of long-term retirees and fifteen in-depth interviews of caregivers for retirees incapable of participating. The study seeks to understand how middle-income market retired Americans and Canadians manage their assets and spending decisions over the long-term. For more information related to this topic, please see the 2015 Risks and Process of Retirement material. If you have any questions or comments regarding the report, please contact Steve Siegel, Research Actuary atssiegel@soa.org. 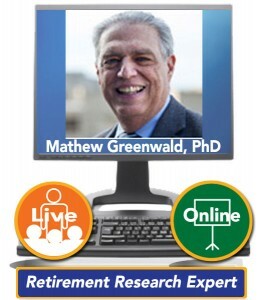 Mathew Greenwald, PhD, President of Greenwald & Associates, is a recognized financial and research expert with more than 30 years’ experience in financial services and market research. He founded Greenwald & Associates in 1985. Today, in addition to providing strategic direction for the company, Matt plays an active role designing and analyzing survey research and conducting focus groups with consumers and financial professionals.